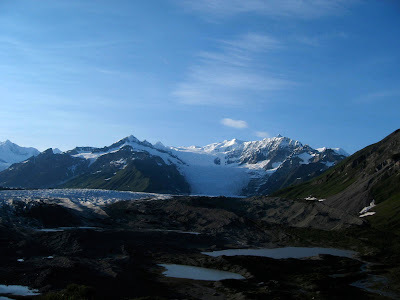 The Kennicott Glacier in Wrangell-St. Elias National Park. This post is way overdue! 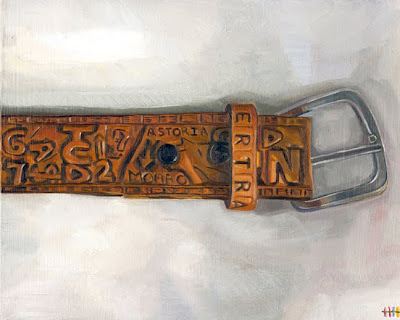 I seem to focus this blog on travel adventure and art happenings of note, however I have not traveled for a few months. 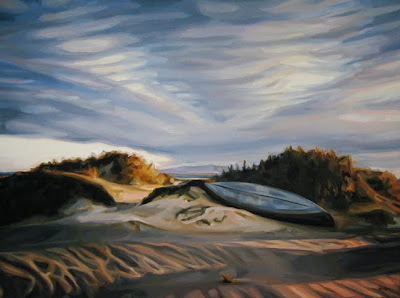 Fortunately I have had time to complete more paintings and, most excitedly, made plans for new adventures in 2010! 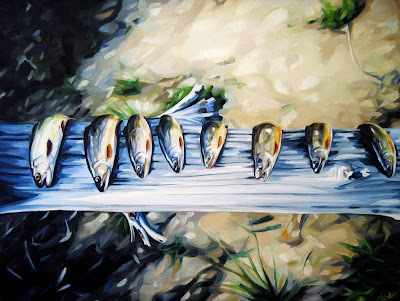 "Chris' Canoe, Near Golfo", oil on canvas, 18"x24"
"Diary Of A Supertramp(study)", Oil On Panel, 8"x10"
"Pilgrim's Dinner", Oil On Panel, 18"x24"
As a corollary of the pictorial book about Chris, the paintings that I produce will be exhibited as a group, probably also happening in 2010 or 2011. The location has yet to be determined but in all likelihood it will be held at Abbozzo Gallery in Oakville, Ontario, Canada. 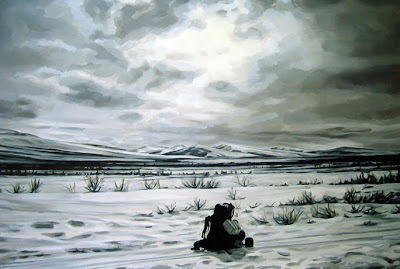 Ideally I would like for the exhibition to travel, because Chris was an explorer through and through. Stay tuned for details surrounding the exhibition and book! The Newfoundland Portraits exhibition was a huge success in November 2009. Many friends and supporters came out to the show...I will never forget it! As for current artistic projects I am continuing to work on individual figurative paintings, commissions and work for galleries. There never seems to be enough hours in the day but it is wonderful! Please check out my website for new paintings from the show and out of the studio! I am also listing songs, posting paintings and offering daily tips on art and creating paintings on my Twitter profile here. Adventure travel and travel in general, along with art, are my two favorite things. 2010 brings with it many opportunities to explore the world, meet new friends and create some paintings based on these experiences. The second book that I will produce will be a travel/art book based on explorations of Alaska, British Columbia, Newfoundland, The Yukon, Arizona, France and New York City...and that is just so far! This book will come out in 2011 or 2012. I will this blog updated with travel journalling and the status of this project. With the onset of the colder weather it is easy to go inward, into a period of emotional and physical hibernation. In addition, the holiday season brings with it its own set of emotions, bittersweet ones sometimes! During this time I think it is particularly important to be easy on ourselves, to open our hearts and minds to others, and to care for ourselves as holidays can be very stressful. Our society is so often linear, rushing from A to B as quickly as possible..when perhaps we could circle back around to A and rest their for awhile. I wish you and yours a Happy Holiday season and a prosperous New Year! !